Apum developed as one of the more early larger states in Syria and northern Mesopotamia which encompassed more than one city and operated more on the basis of a small kingdom. Apum's capital was at Shehna (or Shekhna, modern Tell Leilan) in the lush pastureland of the Khabur Valley. The site was first built up in around 2600 BC when it was expanded from a farming village. Dominance under the Akkadian empire followed, but severe drought in around 2200 BC led to it being abandoned for about three hundred years. At its height in the eighteenth century BC, Apum controlled the eastern part of the Khabur/Habur Basin, extending its control beyond Hamoukar, a vacant non-participant in the Amorite population. The city, however, remained a 'hollow capital', filled only sparsely with elaborately decorated administrative buildings, such as the Acropolis temples. Apum is first built up from a farming village into a major town as similar city states flourish in northern Mesopotamia and Syria. Northern Mesopotamia is conquered by the Akkadian empire. The indigenous rulers of Apum are removed from power. Abrupt climate change leads to severe drought. In an event probably related to this, the Akkadian empire collapses when southern Mesopotamia is overrun by the Gutians. 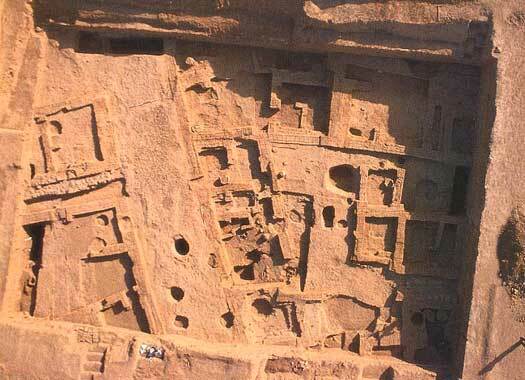 The drought also forces the abandonment of Apum, with the last of the buildings being deserted by 2140 BC. Around this time, Assyria has a trading centre at Kanesh in Anatolia, with Apum, recently reinhabited, appearing to play an important role in the trade route between northern Mesopotamia and Anatolia. Apum is conquered by Shamshi-Adad and is incorporated into the kingdom of Upper Mesopotamia. In about 1806 BC, Shehna is taken as the capital of this new state and is renamed Shubat-Enlil. Upon the collapse of the kingdom and the re-establishment of much of the previous order in northern Mesopotamia, Apum establishes trade relations with Zimri-Lim of Mari. With one of Shamshi-Adad's officials retaining control of the city, it probably remains part of Ishme-Dagan's domains while he rules from Ekallatum. Between them, Samija and Ishme-Dagan can barely hold onto the city. Nearly every king in the region hopes to conquer it and lay their hands on Shamshi-Adad's accumulated wealth. For a decade from 1772 BC no king is able to hold onto the city for long, with six different rulers controlling it for short periods. The first three appear to be vassals of Qarni-Lim of Andarig. Haya-abum and Zuzu are both mentioned in Mari's archives, but Zuzu only holds onto the city for a number of months before his death. Initially constructed under Shamshi-Adad, the Northern Lower Town Palace in Apum is also associated with Qarni-Lim and is probably used by him as his 'embassy' when he visits the town - making it the earliest-known embassy. Seized the city? Vassal of Andarig? Vassal of Andarig. Ruled for few months. Fell from the city wall. The city falls under the control of Elam as the most powerful of its occupiers. A decade after Shamshi-Adad's death, Atamrum of Andarig seizes the city back from Elam, probably violently, as evidenced by ashy deposits and burnt floors in Levels 3 and 4 of the Eastern Lower Town Palace. His successor, Himdija, continues to control the city, probably also rebuilding the palace (Level 2). There is a gap in the city's records, but by 1750 BC the political chaos engulfing Apum seems to abate. Records found in the Eastern Lower Town Palace document the final three rulers of the city, probably all members of one family, relatives of one Dari-epuh, who may or may not himself have ruled before them and may have been the one who seized (or freed) the city and managed to hold onto it. By this time, Apum's territory is a small part of the Khabur Plains, and campaigns are conducted to the south and east. While Mutija is on the throne, his two nephews hold positions of authority on the borders of the state, in a form of governance that resembles that of Shamshi-Adad's. Till-abnu renews a treaty with traders from Assur, who live in their own colony within the town (after having been thrown out during the Elamite occupation). The thriving city is sacked by Samsu-iluna of Babylon in the twenty-third year of his reign, and Yakun-ashar is killed. The city never recovers. Temporary settlers build ovens, a brick platform, and a few fragmentary walls on top of the ruins of the Eastern Lower Town Palace (Level 1), before the site is abandoned completely in around 1700 BC. In the political collapse which follows the Hittite destruction of Alep and the sacking of Babylon, the region suffers further decline. By the end of the century it is part of the Mitanni state which unifies much of northern Mesopotamia.